c) for Parkview Slopes on Cates Hill. Bowen Island has a publicly stated goal of sustainability — most commonly described as a three-legged stool, with each leg representing one of three fundamental elements: environmental, economic, and social well being. In the past the island has focused primarily on the environmental leg. It seems to be widely recognized that greater emphasis is needed now on the legs of economic and social well being. 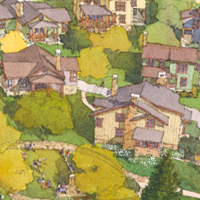 The rezoning proposals focus on creating long-lasting new business initiatives toward the development of a sustainable local economy, and diversity of housing forms to retain and foster a healthy diversity in Bowen’s social fabric (i.e., age, lifestyle, income, family status), while at the same time maintaining sound environmental principles and practices. In short, the proposals take another step in implementing some of the most important key objectives of three successive Official Community Plans. For more information about the reasons for the proposals, and key project objectives, see Why? A “pilot project” regarding AFFORDABLE MARKET HOUSING was the subject of a rezoning application by Cates Hill Joint Venture in November 2014 (amended in July 2015 and March 2016) to allow stratification of a home with attached suite on each of Lots 62, 64, 65, and 68 on Rivendell Drive on Cates Hill. Identical homes with suites can be built under the current zoning, which permits a dwelling plus secondary suite on each of the lots. The only change we requested wasthe ability to stratify the home and suite so that both can be owned separately. The proposed rezoning is intended as a “pilot project” to explore and evaluate the market response to a form of affordable home ownership which, despite a widely recognized need and strong demand, is currently not available on Bowen Island. On July 11, 2016 Municipal Council gave final reading to a bylaw that allows stratification of a home with attached suite on each of Lots 62, 64, 65, and 68 on Rivendell Drive. For more information about the Affordable Market Housing proposal, see Affordable Market Housing—”Pilot Project” on Cates Hill. The SEYMOUR LANDING area at Cowan Point is approximately 54 acres in size. In summary, current zoning permits 25 dwelling units (could range in size from 9,750 square feet to 24,000 square feet each), a 20-room inn (which is marginally viable at best) with ancillary uses, and a retreat centre. 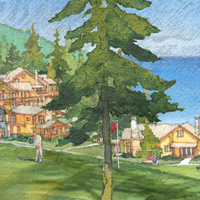 The combination of 3 primary economic uses (i.e., inn/commercial guest accommodation, retreat, and independent/supportive living) allows the provision of shared common services (e.g., meals, housekeeping, laundry, transportation, administration and management) at a scale of operation that is economically viable, but that would be difficult to achieve on Bowen Island by any of those uses alone. Public access to the waterfront on District Lot 2448, including a small waterfront park. 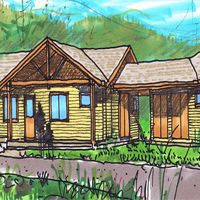 For more information about the Seymour Landing proposal, see Seymour Landing. The PARKVIEW SLOPES area on Cates Hill is approximately 21 acres in size. Current zoning permits 23 single-family residential homes, plus an acre where the Tir-na-nOg Theatre School is located. Confirm theatre school use and other community uses next to the existing theatre school building, such as daycare, assembly, etc. For more information about the Parkview Slopes proposal, see Parkview Slopes. On July 11, 2016 Municipal Council adopted the bylaw that will allow the pilot project for Affordable Market Housing on Cates Hill to move forward.